convert video to flash, flv encoder, create flash video blog. 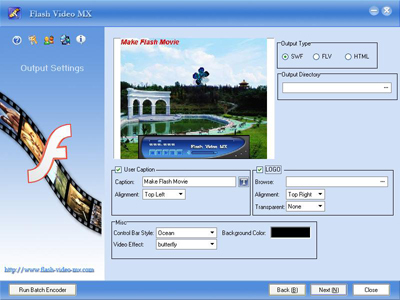 Flash Video MX is a very easy-to-use yet professional software tool to convert your video to flash (movie to flash, mpeg to flash, avi to flash, wmv to flash) that can be played on Internet Explorer with high quality. It supports almost all types of source video files such as mpeg, avi, mpg, wmv, rm, rmvb, mov and so on, and can generate flash 7,8 video output, then get the flash on your web. With Flash Video MX, you can add special effects, movie beginning and movie end, edit video quality, frame rate, zoom scale and audio effect, and even replace the original audio with your favorite music to make flash! Convert video to flash is just a few clicks! Flash Video MX is also a good flv encoder, flash video encoder. Moyea Flash Video MX Commandline SDK is a set of development kit to help developers build "video to FLV " application programs online. With this SDK, you can realize yourself what YouTube has done, and you can also easily integrate "video to FLV " function to your desktop application programs. This tool runs on Windows and supports two kinds of programming interface: the command line interface and the COM/Automation interface, thus you can use the COM object in any COM-enabled development environment like VC/VB/Delphi/ASP/.Net, etc. Modify a brand-new method of the output file. Now Flash Video MX can help you output a flv file with an independent swf player file. Update the control bar completely, and add many exciting functions, perfecting the original functions. Modify the operation in movie beginning and movie end, and make it easier to use. Add the functions to place a user-defined video before the video and after the end of the video. Add the function to automatically generate a thumbnail and set a frame as thumbnail. You can also specify the size and the format of the thumbnail. Add the function to set the position of "Logo" and "User Caption". It is especially comfortable when you are setting the position of "Logo" and "User Caption" in batch encoder. Perfect the support to multiple users. You can access to our software without the authority of the administrator. Perfect the support to multiple language systems. Further personalize some operation process, and update the UI of the software. Upgrade the video decoding module, and strengthen the stability of the software. Add SWF CuePoint function, and make CuePoint support Unicode parameters. Add Player API, through which allows the Flash developer to control the control bar.